Win a HSV Chevrolet Camaro 2SS Coupe & $100,000! Want to win a car? How about hitting the road in a quintessential American muscle car? Look no further than the Mater Cars for Cancer draw – one lucky ticket holder will win a prestigious HSV Chevrolet Camaro 2SS Coupe. It’s undoubtedly a stunning car and a limited lottery with only 40,000 tickets! Featuring a 6.2L Generation V LT1 Direct Injection V8 engine, 20″ alloys, leather interiors, sunroof, and a Bose audio system, the 8-speed automatic offers one excellent ride! First prize includes $100,000 cash/gold bullion*, on-road costs, dealer delivery costs, CTP insurance, and GST. The prize is delivered ex Brisbane, Australia and are not transferable or redeemable for cash. *Cash is only available up to the maximum value permitted by legislation under the laws of the state that the winner resides in – gold bullion for any remaining balance. Increase your chances of winning with a ticket book. 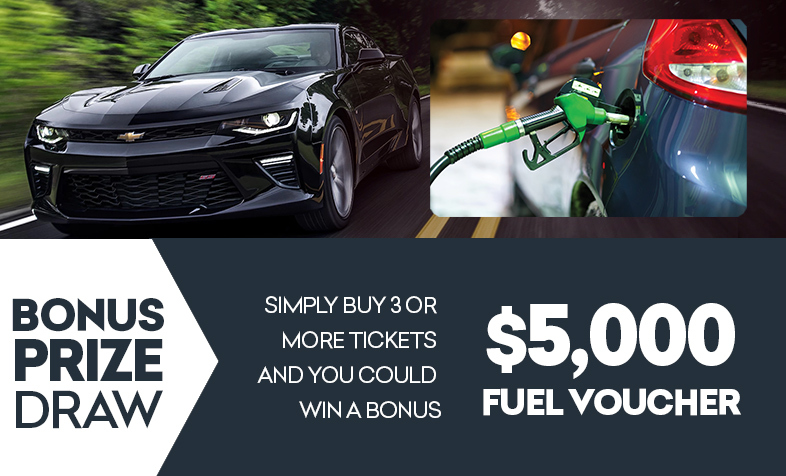 Simply buy 3 or more tickets and you could win a bonus $5,000 fuel voucher. Get 1 chance for every 3 tickets purchased! Just think about where you could go with a $5,000 tank in your arsenal. Not only does your purchase give you the chance to win a car, but the lottery also helps the Mater Foundation to fight cancer. All money raised through the Mater Cars for Cancer lottery helps fund medical research in the diagnosis and treatment of cancer and other conditions in people of all ages. This Mater Cars for Cancer draw has now closed. However, you can always enter a charity lottery draw on Oz Lotteries for your chance to win a stunning prize and help support a great cause. Win a limited edition Mustang ROUSH JackHammer! Win a $204,207 Shelby Super Snake Mustang GT! Support Cancer Research with Maters Cars for Cancer!